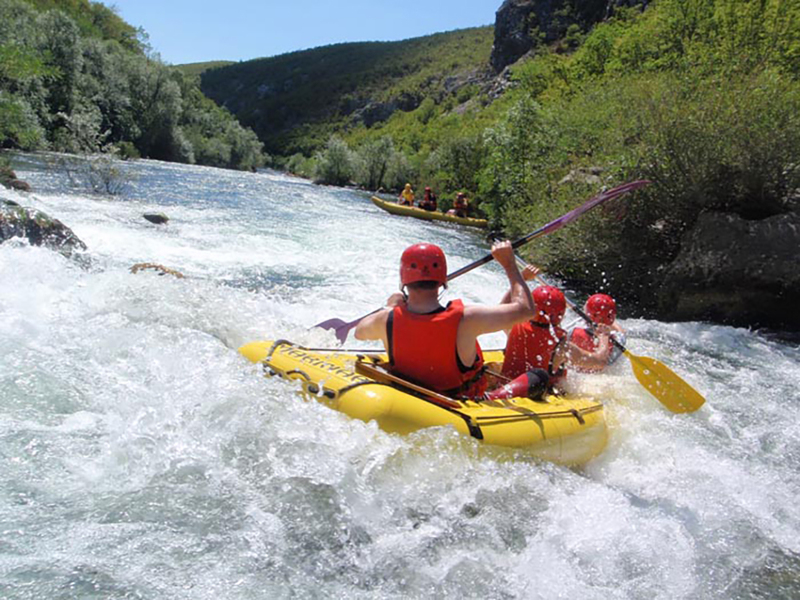 Enjoy a week of activity on the Dalmatian coast as we experience the thrills of whitewater rafting, sea kayaking and take the challenge of canyoning through caves and waterfalls. There is also time to discover neighbouring Trogir's collection of cobble stoned squares and medieval architecture, not to mention its fine resturants and bars, making this an ideal family holiday to Croatia. Arriving into Split airport, transfer to Ciovo Island, situated just off Trogir. The hotel will be our base for the coming week and is ideally situated on the coast for exploring the scenery around the island and to enjoy the Croatia's lifestyle. The hotels facilities include a swimming pool and bars to make your stay as comfortable as possible. We enjoy a traditional Croatian home-cooked meal which affords us the perfect opportunity to become acquainted with our surroundings and our travelling companions for the coming few days. Our first full day in this beautiful region sees us exploring something of Croatia's idyllic rural landscape. Beginning our walk from our accommodation, we head to the monastery Gospa od Prizidnice. The monastery which includes a convent and small church enriched with ships was constructed in the 16th century by hermits and is situated in beautiful natural surroundings on stone cliffs beside the sea. The route provides the perfect introduction to a part of the world that still retains a sense of being less developed than many other regions of Europe. After walking back to our hotel, we can enjoy the remainder of the afternoon relaxing by the pool. One of the best ways to appreciate the Cetina River and its impressive gorge is from the water, and today we splash and crash through the rapids along part of its rugged course, taking in the rich vistas of lush vegetation, glorious lakes, mysterious caves and towering cliffs as we follow the river's path. The river's source lies somewhere deep within the depths of the Dinara and Gnjat Mountains, where a series of wells feed into the river at the northern town of Vrlilka, continuing down a course some 100km in length towards the Adriatic, making it the longest river in Dalmatia. Our guides are very experienced in the currents of the river and are used to dealing with family groups, ensuring a happy experience for all. All equipment and instruction will be provided, with wetsuits, life jackets and helmets supplied - a change of clothes for the post-rafting journey back to our hotel is recommended and remember to wear shoes that you do not mind getting wet. The rapids themselves are classed as grade 2-3, which makes them easy to medium in terms of difficulty, allowing you plenty of chance to take in the stunning scenery as you flow past, yet enjoying the adrenalin rush of this exciting sport. Today has been left free for you to enjoy as you wish. You may like to try a half-day climbing excursion in the surrounding mountains with a local guide near Omis. Alternatively a visit to nearby Omis town should prove to be an interesting diversion or Krka National Park. The park is an unaltered area of exceptional natural beauty. Although the main purpose of the park is primarily to serve science, culture, education there are also a number of visitor attractions including the Krka River and its seven waterfalls. There are also walkways through the park and over its lakes which gives a unique perspective to the visit plus some areas of the park are connected via boats which can be used by visitors. Transferring to Zadvarje this morning we return again to the Cetina River for an exciting canyoning excursion in the gorge, which will include the spectacular 60 metre high Gubavica Waterfall. High cliffs, plunging waterfalls, crystal clear pools and underground tunnels all await our intrepid explorers for what is a unique way to explore the gorge and to discover more of a region that has been thousands of years in the making. Canyoning involves a guided walk, scramble and clamber over rocks, past waterfalls and pools and paddling down a river gorge. The route is not suitable for children aged under 8 years old. Full instruction and equipment will be provided (helmet, full wetsuit, life jacket). Anyone suffering a fear of heights may wish to opt out of this excursion due to the entry point into the gorge and the cliff jumps into rock pools, as will children aged under 8. This afternoon has been left free to relax by the pool after what is bound to be an exciting morning out. A further free day allows for more personal exploration, or sheer lazy indulgence. You might like to join your local guide on an optional visit to the ancient and captivating town of Split which is situated on a peninsula and surrounded by historical towns and settlements. We take a walk through the 4th-century Diocletian's Palace to visit its ancient cellars, Roman temples (today Christian ones), cathedral and the famous Golden Gate. 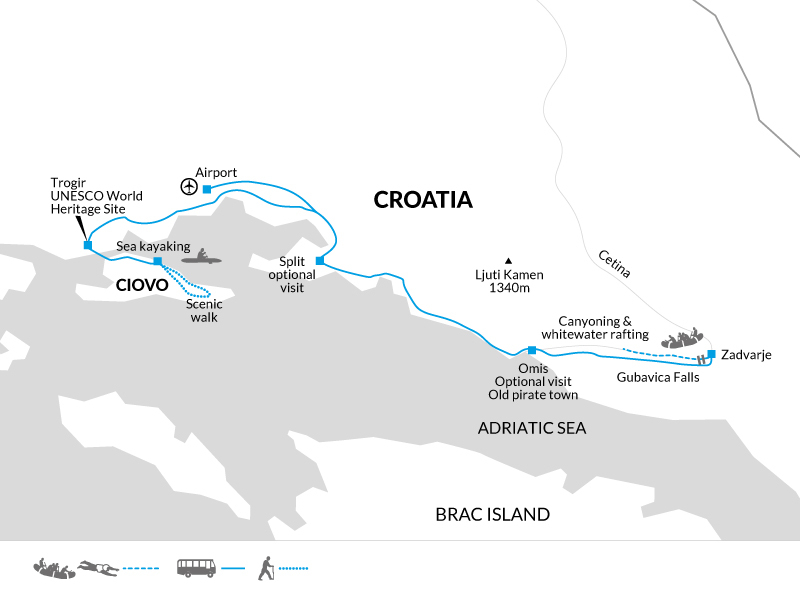 We would then continue with a bus ride towards Trogir which is a UNESCO World Heritage Site. Without doubt, the town is one of the most picturesque settings along this part of the coast. With a rich history that dates back to the 3rd century BC, Trogir is a delightful collection of cobble stoned squares and medieval architecture, whilst its Romanesque cathedral is considered to be one of the most exquisite in the entire Adriatic. Spanning some three centuries, it boasts a superb entranceway in its west portal, carved in the 13th century by the master mason Radovan. The town also boasts Venetian Gothic mansions, an impressive clock tower and a comprehensive collection of church artwork displayed in the 13th century Church of St John. What makes Trogir such a delight to wander around though are its meandering alleyways, filled with cafes and restaurants and its elegant riverfront promenade, which leads up to the Kamerlengo Fortress, a 15th century edifice with imposing battlements and a huge octagonal tower. You may like to visit one of the town's many excellent eating establishments before returning to our hotel for the evening. Today we head to the Pantana Old Watermill near the town of Trogir for a morning of sea kayaking adventure. The route takes us along the River Pantana, through the reed canals and on to the sand lagoon which feeds into the sea. We continue our journey travelling in the direction of Trogir with the old town being completely surrounded by the sea. We make a full circle around the island with great views of the town from the kayak. On the way back to Pantana, there is the chance for a swimming break at the beach. Full instruction and lifejackets will be provided and guides will accompany us during the day ensuring that even first-time paddlers enjoy the kayaking. Then it is back to the hotel for our final opportunity to sample the delicious home cooked Croatian fare that has been such a part of the whole experience. The trip ends after breakfast at the hotel. July and August are the hottest months, but early and late in the season go prepared with clothing to suit drops in temperature and the showers. You'll need your swimming gear and a beach towel. Light rainwear may be needed at any time of year, and a warm fleece/jacket is recommended for cooler evenings and nights. Comfortable walking shoes, trainers and sandals; some strong footwear that you don't mind getting wet - a pair of old trainers would be ideal. Wetsuits, lifejackets and helmets for the canyoning, canoeing and kayaking excursions will be provided locally. A water bottle, sunhat and high factor sunscreen are all essential though and you may also wish to bring your own mask, snorkel and shows suitable to wear in the water to protect from rocks and sea urchins. For this we suggest 150 Kuna per family member. Your family run hotel for the week is located on the Island of Ciovo which is 4 km from the historic town of Trogir. The hotel overlooks the beach and the clear blue waters of the Adriatic and is surrounded by pine forests. Facilities include; a restaurant offering traditional and western cuisine, a large pool, a bar and a terrace area with views over the coastline. All en-suite rooms have air conditioning, satellite TV and a mini bar. Wi-Fi is available in the lobby of the hotel. Get active or relax, the choice is yours: Known in some quarters as ‘Europe in miniature’ for its combination of coastline, mountains, historic cities and easy going lifestyle it’s possible to combine Croatia’s stunning natural beauty spots with its pristine bays and sapphire waters with a fun filled week of activities on a family holiday to Croatia. There is so much to keep the kids occupied from White water rafting, sea kayaking, climbing and canyoning, all included in the price. It’s no wonder this week long active adventure is one of our bestselling family adventure holidays. Triple rooms: We use a family run hotel overlooking the sea, with a large outdoor pool. The hotel offers triple rooms to be included within the booking, if you would like this option please ask our Sales team for further information. Average Age: As a guide we have identified the actual average age of the children who have travelled on this trip over the the last 5 years, to help you decide whether it's the right one for your family. The average age on this trip is 13 years old, this trip is suitable for children of all ages from 7 upwards, however the minimum age for canyoning is 8 years old. This trip is wet and active ! A range of adventures await from whitewater rafting, canyoning and sea kayaking to a great walk along the island where we stay plus optional trips to discover the coastal towns of Omis, Trogir and Split. Our base is on the picturesque island of Ciovo a short distance from Split. Ciovo is an ideal base, less crowded than the mainland, more laid back, with fantastic views back the mainland as an added bonus. Our hotel has been chosen for its large pool and beach front location which is a great place to return to after your pursuits. Active families will love this great value adventure with a number of included activities and meals within the price.